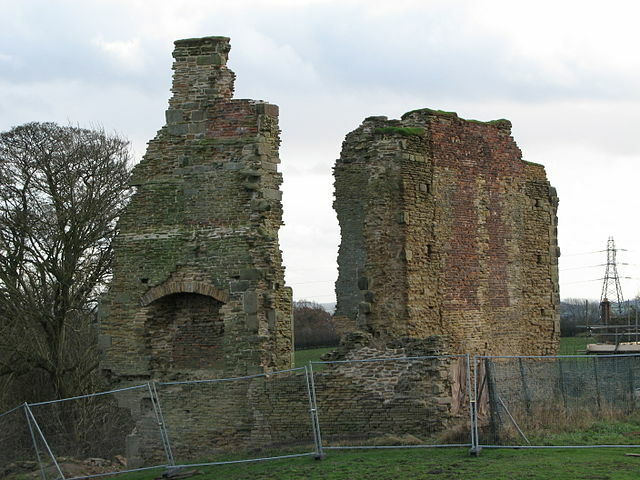 Notes: Codnor Castle is a ruined 13th-century castle in Derbyshire, England. The land around Codnor came under the jurisdiction of William Peverel after the Norman conquest. Although registered as a Scheduled Ancient Monument and Grade II Listed Building the site is officially, as at 2008, a Building at Risk. The castle is a stone keep and bailey fortress and was established by William Peverel. The present fragmentary remains represent a three-storey keep and a strong curtain wall and ditch, flanked by round towers. The outer bailey is on a lower level and was constructed at a later period. The castle overlooks the Erewash valley and the counties of Derbyshire and Nottinghamshire. It originally had a deep moat and on its eastern side there was once a considerable abundance of trees, which have now been cut down. On the west side there was a courtyard that was strongly fortified by huge round towers, which had battlements. In other parts of the ruins there is evidence that the outer walls had loopholes included to allow bowmen to use them if necessary.